Picture the typical mall food court. Then add hundreds of food stalls selling just about all things Chinese food you can imagine. And you’ve got Singapore’s Chinatown Complex Food Centre. For food lovers, it’s an absolute paradise. Chinatown in Singapore is an amazing place to eat, and there are so many food hawker centers. 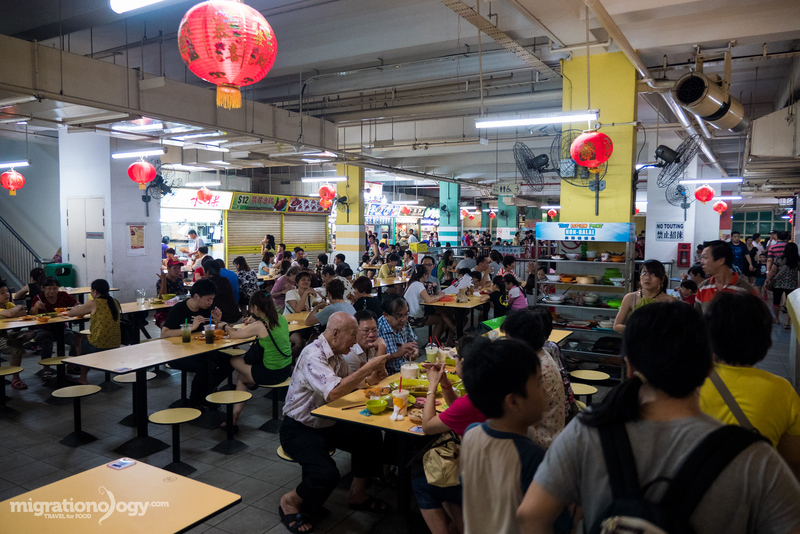 But Chinatown Complex Food Centre is one of the hawker centers that blows the rest away when it comes to variety of Chinese food, size, and busyness. I couldn’t find any real trustworthy information, but some sources say it’s the biggest hawker centre in Singapore with hundreds of food stalls. From the bottom floor, you don’t really expect the food court to be that big. It sort of looks like you’re walking into an open air Chungking Mansions – the legendary building in Hong Kong. But then you take the escalator up to the second floor, and the space opens up into a labyrinth of bustling food stalls and bridges – a place that will make any food lover shiver with excitement. Chinatown Complex Food Centre is somehow not all that popularly written about, and it’s not typically included on lists of must-eat at hawker centers in Singapore. When I put out a video and blog post asking where to eat in Singapore, I received a number of recommendations to try Lian He Ben Ji Claypot Rice, which happens to be located at the Chinatown Complex (a big thank you to Gladys, Tan, and Jimmy for recommending this place). 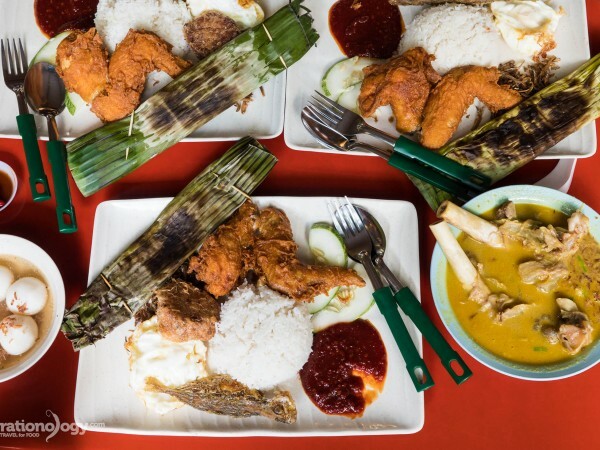 25 Must Eat Dishes in Singapore! So not knowing what to expect, my wife Ying and I showed up one evening at about 6 pm, to find a crazily busy atmosphere with a near unimaginable selection of food. I was so happy. The food court is a little confusingly set up, it’s pretty old style, so there are are bridges and cul-de-sacs, and side lanes within the food court. 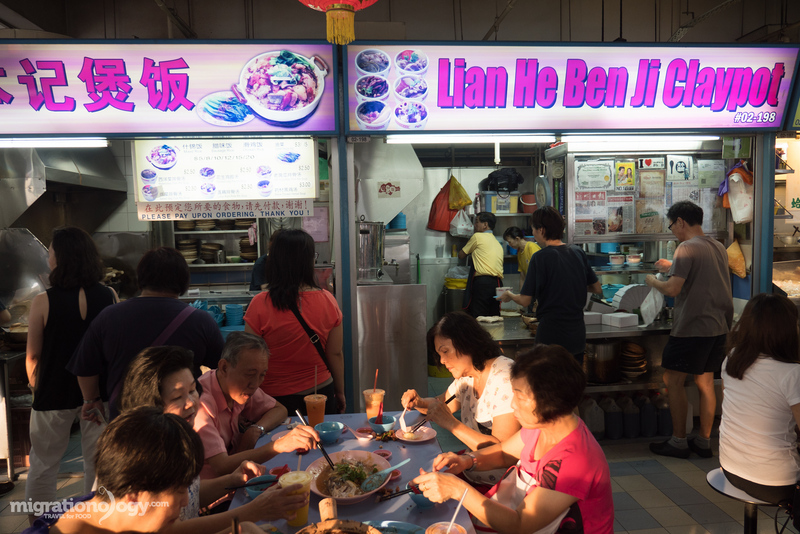 It literally took me about 15 minutes to finally locate Lian He Ben Ji Claypot Rice, positioned all the way at the back of the hawker centre, in the right back corner (if you’re coming in from the main street side). All the tables in front of the stall were packed, some people were eating, others were waiting patiently. 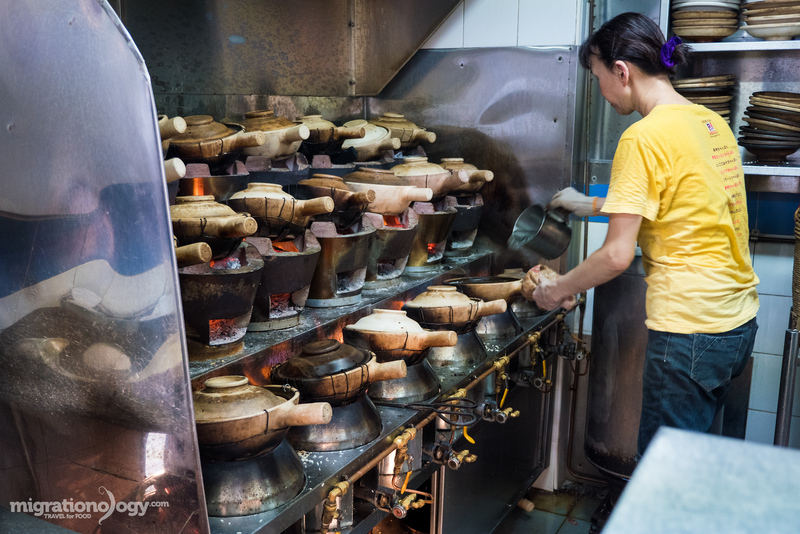 I could immediately smell the aroma of the claypot rice, and then I saw one of the most spectacular cooking displays of claypot rice that I had ever seen – they literally had bleacher rows of flames and claypots all cooking harmoniously with a puff of steam rising to the ceiling. The lady running the main cooking operation expertly added mixtures of raw rice and water to the claypot, stirred, and put the lid on, somehow remembering the length of time needed to cook the rice in each claypot without getting mixed up. Making claypot rice I think could be considered a sport, and I was very happy to be a spectator. It’s really an amazing art. I was doing a quick video introduction, saying I was about to put in my order, when a group of friendly ladies, saw me vlogging, and all smiled. They mentioned to me that there was a 1 hour wait, so I better go and put in my order immediately. They had a number of different claypot rice sizes that you could order, depending on how big of a claypot you wanted to eat (many people just ordered 1 claypot to share with their entire group – they had some huge sizes as well). Since it was just my wife and I, we ordered the $12 SGD size, a medium one. The kind lady who took my order expressed to me that it would take about an hour and a half, just as the ladies waiting for their claypot had told me. I was already in the mood for eating claypot rice, and despite a true test of patience, I was fine with the wait. You know the best thing about a 1.5 hour wait at Chinatown Complex Food Centre is? You have a few hundred other things to choose from to eat as well. 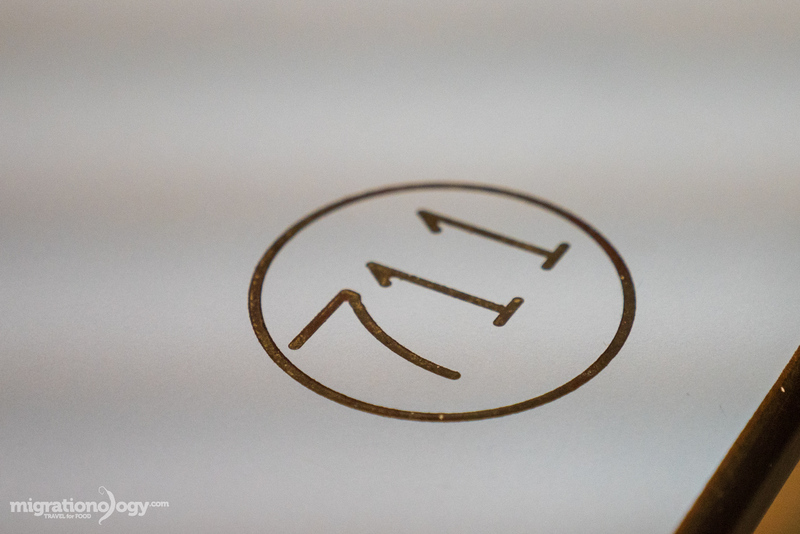 So we found a table, table #711 to be exact. I think there may be well over 1000 tables at the hawker centre, and we sat down to start our wait. Having had a great plate of chicken wings at Chomp Chomp Food Centre a couple days before, we were still into the chicken wings, and so Ying went to grab a plate. I’m not even sure which stall she went to, as I stayed back to sit at our table, but she picked a good one. The chicken wings were golden, and they were just as tasty as they looked. They were roasted over charcoal, sticky and crunchy and just coated in a roasted soy sauce glaze. The side sauce was kind of a nutty sweet and sour sauce. 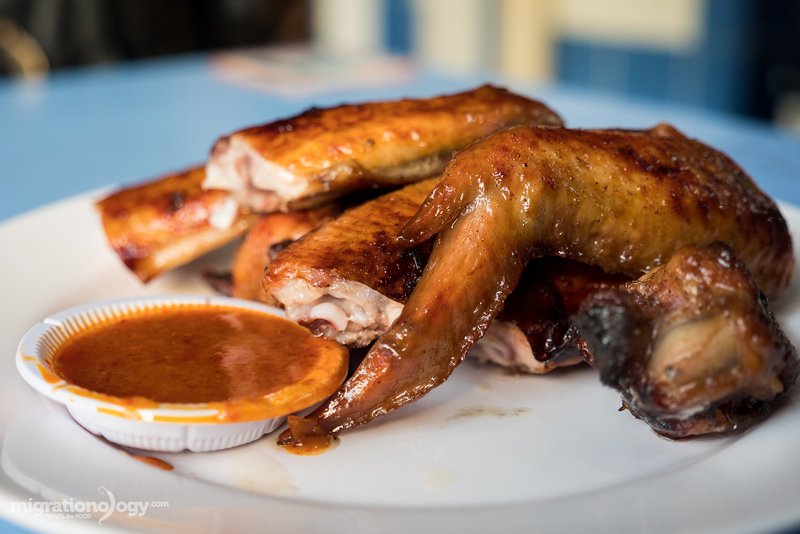 Chicken wings in Singapore make a wonderful pre-dinner snack. 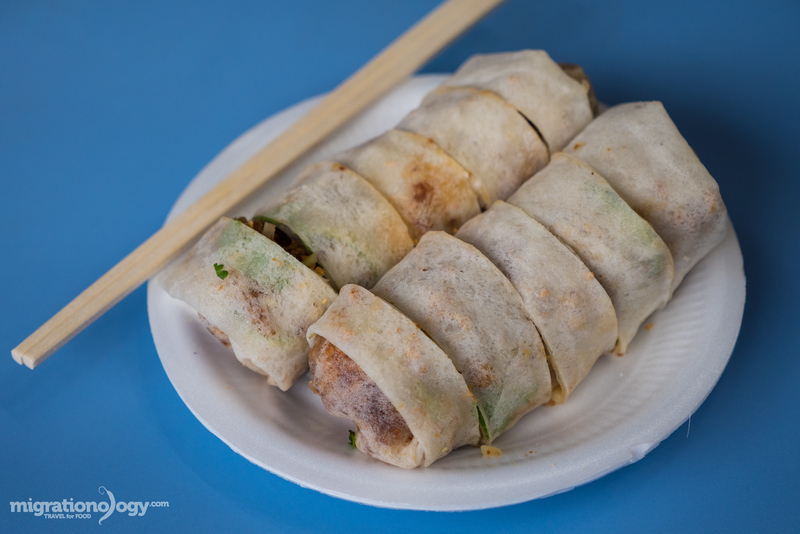 Popiah, which can be described as fresh spring rolls, are originally a Fujian or Chaozhou roll of vegetables and seasonings all wrapped in a thin crepe like wrapper. They are very popular at Chinese food courts throughout Singapore. I think the place I went, with a purple sign, is a chain that’s found throughout the city, because I saw the same sign at a few other food courts as well. Nevertheless, it was busy, and there was a short line of others waiting for fresh spring rolls, and that’s always a good sign of something delicious in Singapore. As soon as I ordered, she rolled up my popiah, adding in a few handfuls and crushed peanuts, thinly julienned cucumber, and finally the bulk of the roll was a mixture of either jicama or as the man in line in front of me told me, it was radish. 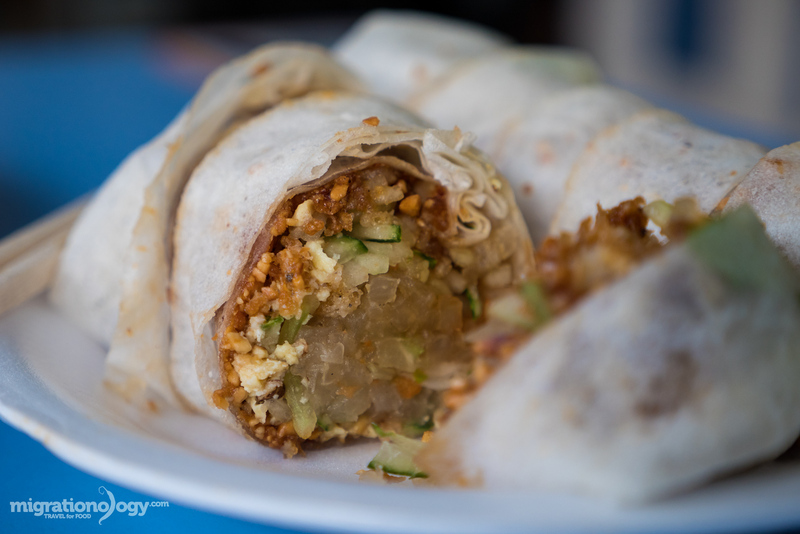 Popiah is one of those things that can either be considered savory or sweet, it’s somewhere right in between, but more on the savory side. It’s mainly a veggie filled roll, with a nutty soy sauce and sweet almost slight molasses like flavor to it mixed within. Overall, I have to admit that popiah is not my favorite snack, it’s a bit too sweet for me, but it was still very refreshing. My wife really enjoyed the popiah. Sill waiting for our claypot chicken rice to arrive, Ying went and ordered an ice kacang, which I had a few bites of as well. 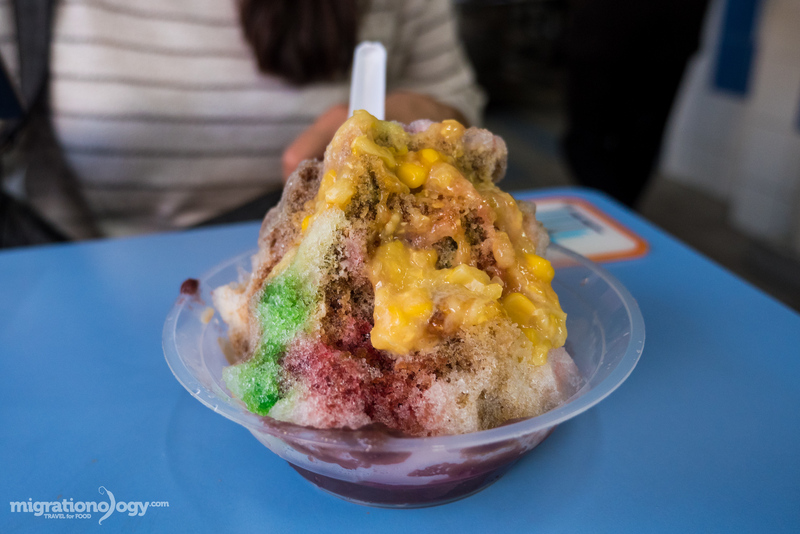 Ice kacang is the Singapore version of shaved ice, a packed snow cone, lathered in a variety of sweet syrups, and topped often with some cream corn. Again, I’m not a sweets guy, but when you’re drenched in sweat at a Singapore hawker centre in Chinatown, a few bites of sweet ice taste pretty good. Finally, time for the claypot rice! 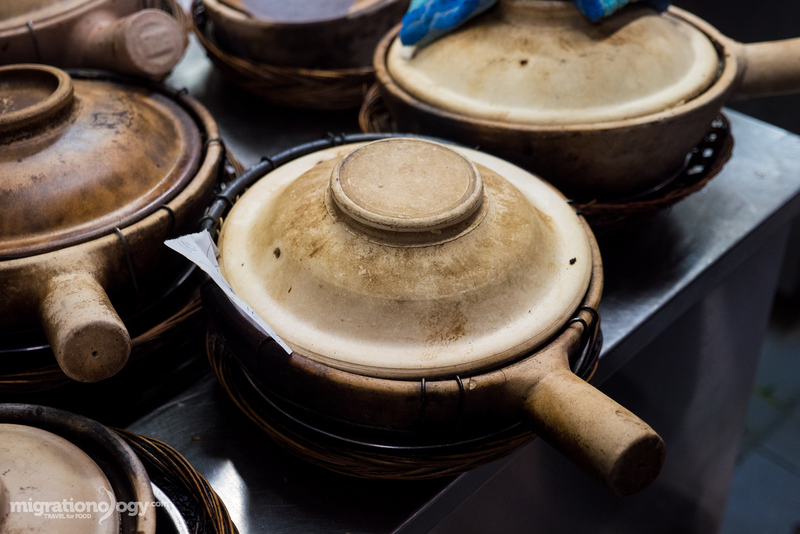 She lifted the lid of our claypot rice on our table, and immediately a puff of steam from the slow cooked rice in the scorching hot pot, filled the humid air. The rice was topped with chicken, Chinese sausage, some slices of pork belly, and some kind of vegetables, and everything sort of melted into the top of the rice. 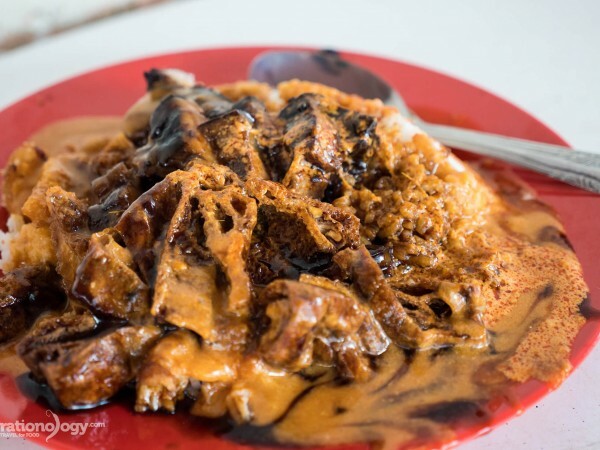 It was served also with a side of sweet soy sauce, that looked to me like kecap manis, and I saw other who ordered the claypot rice dumped all the sauce over the rice – so we followed. The rice was cooked perfectly. Soft and fluffy on the top, with the chicken and Chinese sausage oils dripping down to moisten it. There was also a nugget of salted cured fish on top of the rice as well, which was extremely salty, but was meant to be mixed in to flavor the rice. It was good, but just make sure you don’t get too much of it in one bite or you’ll have a mouth full of salt. On the edge of the claypot the rice was crunchy and had a pleasant burnt roasted taste to it, not unlike the beginning stages of burnt popcorn. 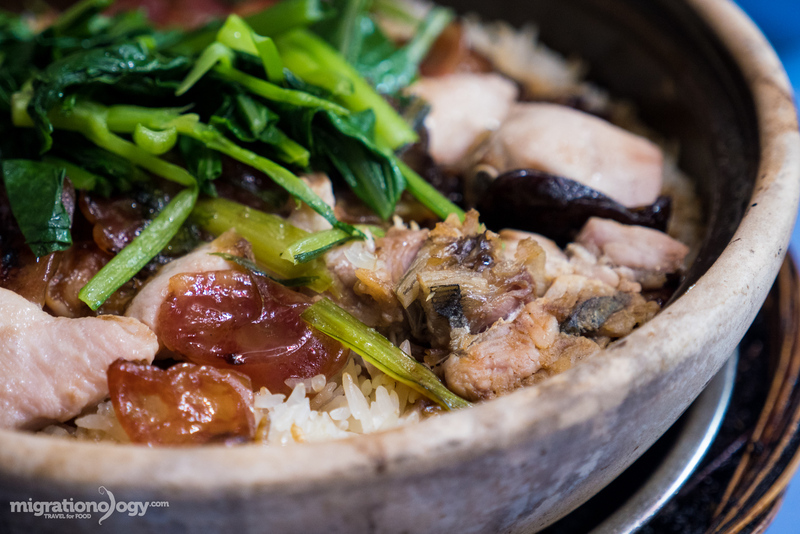 For me, the claypot rice at Lian He Ben Ji Claypot Rice was comfort food. When I was growing up, that’s exactly what I would have wanted to eat just about everyday. It was easy to eat and tasted good, and also with the pleasant busy atmosphere and plenty of snacks to hold us over, it was well worth the wait. After dinner, we were full and happy, and we decided to take a nice evening stroll by the waterfront. 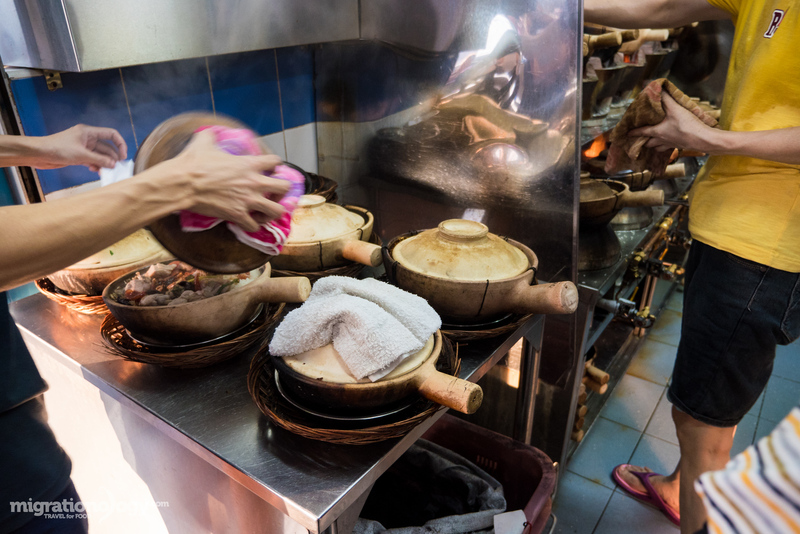 If you have a few minutes, check out the full video of eating the claypot rice at this exciting hawker center in Singapore. 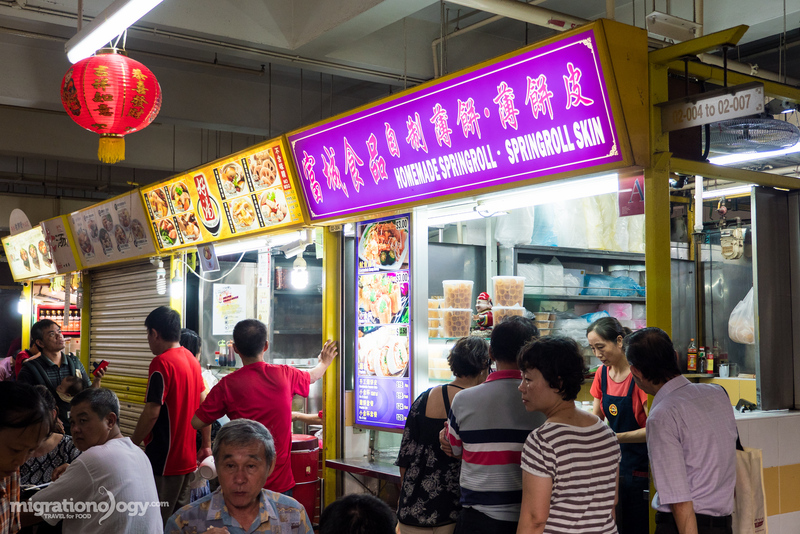 Chinatown Complex Food Centre is one of the biggest and busiest food hawker centers in Singapore, home to hundreds of Chinese food stalls. When I was in Singapore I went there to specifically search out Lian He Ben Ji Claypot Rice to eat claypot rice. 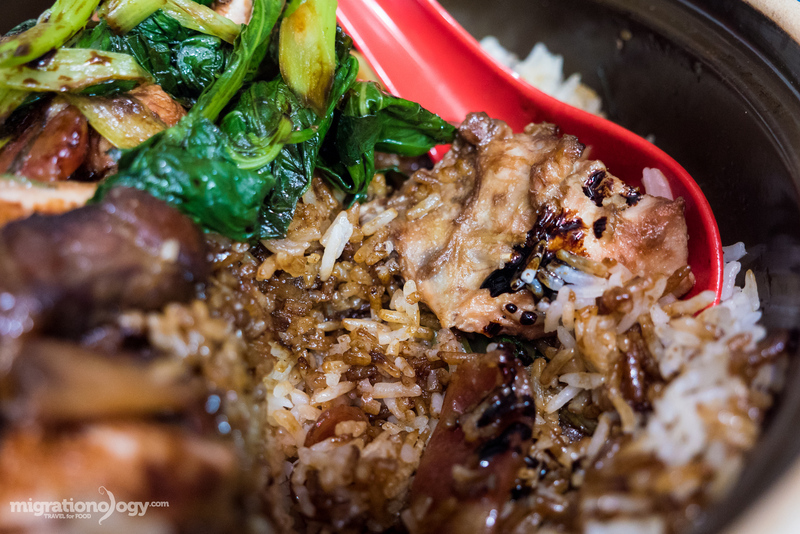 The claypot rice was delicious, cooked to perfection, and comforting with every bite. 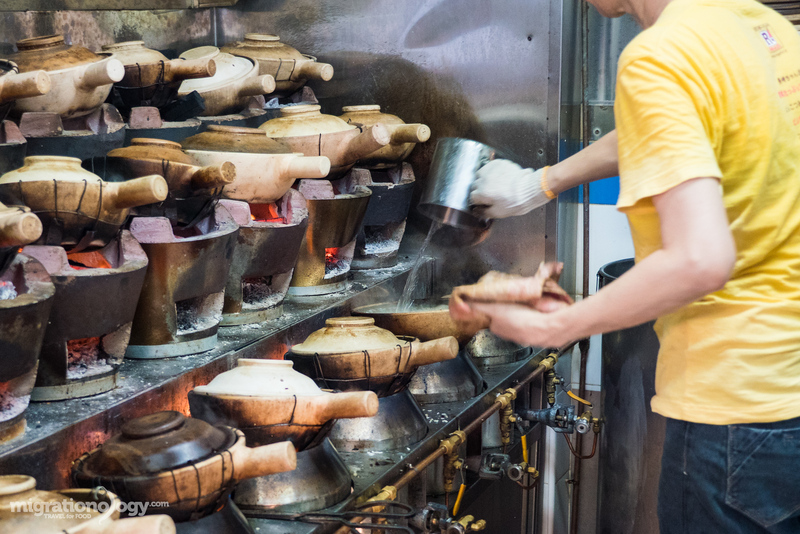 But along with claypot rice you’ll find an unbelievable amount of other Chinese food stalls to eat at, and if you love food, it’s a hawker centre in Singapore you’re not going to want to miss. 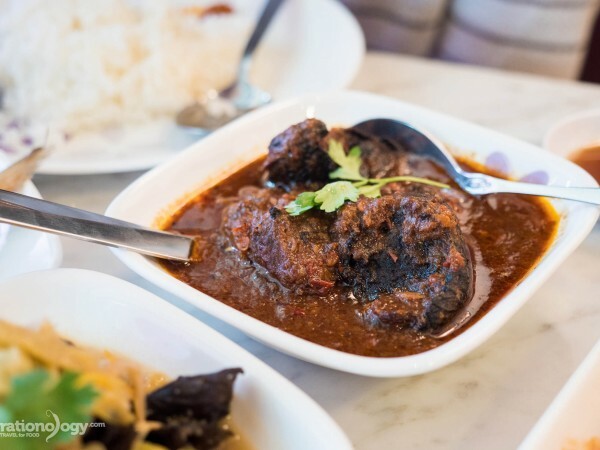 You might also be interested in my Singapore Travel Guide for Food Lovers! 28 comments. I'd love to hear from you! I’m from Singapore but living in Australia. Love reading your blog and oh my! the memories Chinatown Claypot rice is my absolute fav! growing up eating it. it’s one of those beautiful memory of my mum, dad and I having dinner there in blistering heat. I’ll usually go grab some yummy steamed rice rolls (Chee Cheong Fun) and Yam kueh to pack home for supper or breakfast. We also loved the food court and restaurant complex in Changi Village by the bus stop and the docks. A super quiet, underrated part of the city that doesn’t feel like you’re in the city at all. Looks amazing -but a 1.5 hour wait! Wow it better be fantastic – definitely looks it! Singapore was the best in food. It is humid but I just love it. Thank you. Glad you love the food in Singapore! They look fabulous Mark. I think I feel hungry after reading this article and looking at your lovely photos. Thank you for sharing. Thanks Izy, yah lots of interesting things within it. Good claypot rice is hard to find. Here in China, it is quite common, but the good places are few and far between. I love the crispy edges. Will have to check out this place next time I am in Singapore. Hey Enzo, great to hear that, glad you enjoyed it! Just saw a special on the Travel Channel with Andrew Zimmern showcasing places to eat around Singapore! 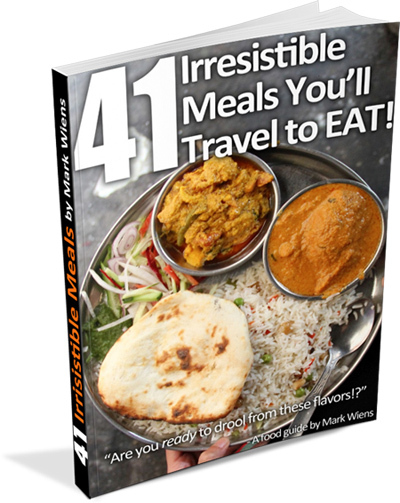 I need to plan a trip to Asia in the near future – the food looks amazing. Hey Chad, cool to hear that! Thanks Elaine, right about that! This makes me eager to go back to Singapore! 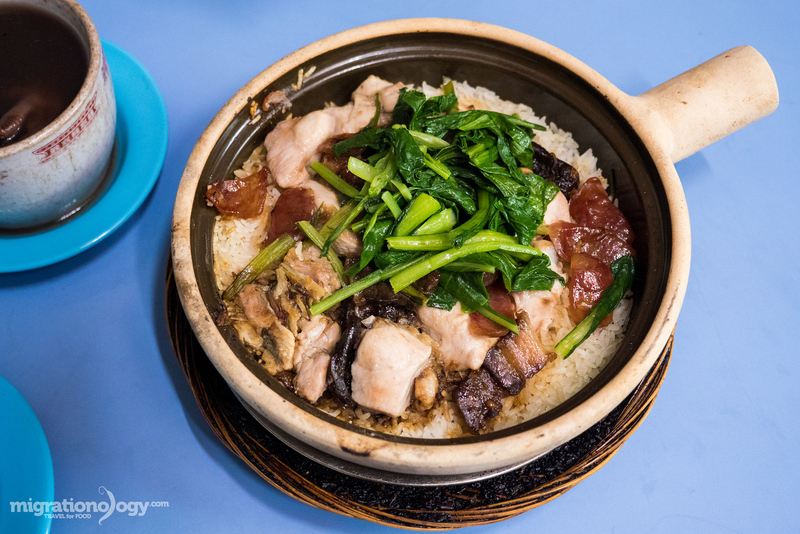 Claypot rice is total comfort food! You’re welcome, thank you for reading, hope you can visit Singapore again soon. I am from Europe and I just came back from Singapore. I randomly discovered a restaurant called “Penang seafood restaurant” near Aljunied mrt (green line). They serve Malay specialties. I really enjoyed the “la la hokkien mee” which has a unique and delicious taste and also the Laksa which is thick and flavourful. Hey Nick, good to hear from you, thank you for sharing your food discovery. Will try to check it out next time I’m in Singapore. Oh wow, that all looks absolutely delicious. 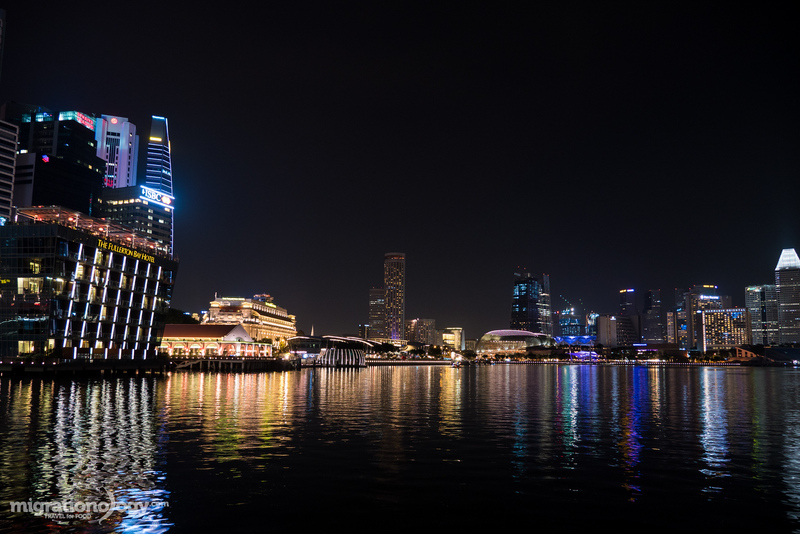 I do wish you had written all of this four years ago when I first visited Singapore 🙂 Hopefully, I’ll be able to return soon – there’s just so much to do and eat there. Hey Andrea, thank you very much, there’s so much good food to eat in Singapore!